This page contains information on how to find journals. If you are looking for a specific journal, you can use WorldCat to search for that journal the same way you would search for a book or other item. To find a specific journal, first use WorldCat to search for the journal by title. Tip: For best results, include double quotes around the title of the journal (ex. "Journal of Canadian Studies"). WorldCat will display your search results, along with several options to filter or sort them. Under Format, select Journal, magazine to see only journals in the results list. If you only want to see journals that are available online, under Format select eJournal/eMagazine. Access the electronic version of the journal. 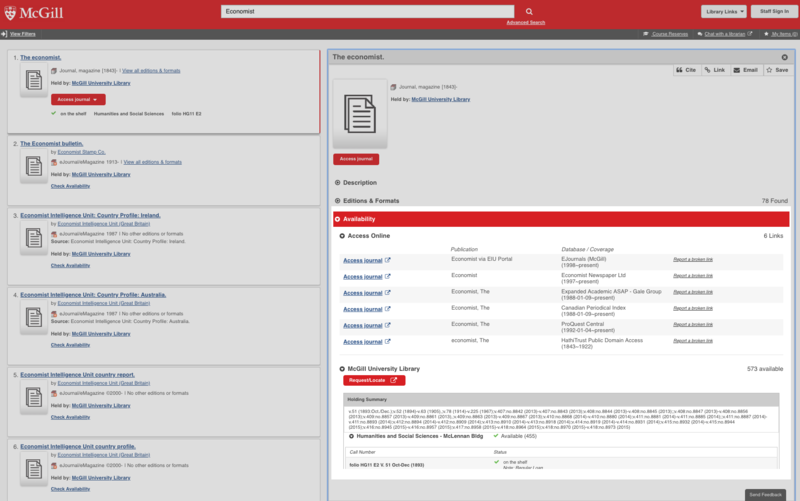 Once you find the journal in WorldCat, if McGill has online access there will be an Access journal link that you can use to go to the e-journal. Retrieve the print version of the journal. If there is no link to the electronic version of the journal, you may be able to find the print version of the journal. If McGill has the print version, on the journal's detail page in WorldCat the Holding Summary section will list the availability information for the print journal. Make sure to note the library branch and call number since you will need that information to locate the print journal. McGill students, faculty and staff may also request a scanned copy of an indivual article from a print journal or delivery of journal volumes for pickup to any branch services desk. Interlibrary loan. If the journal that you are interested in is not in the McGill Library collection, you can request articles using our Interlibrary Loan service. Need help finding journals? Ask us! 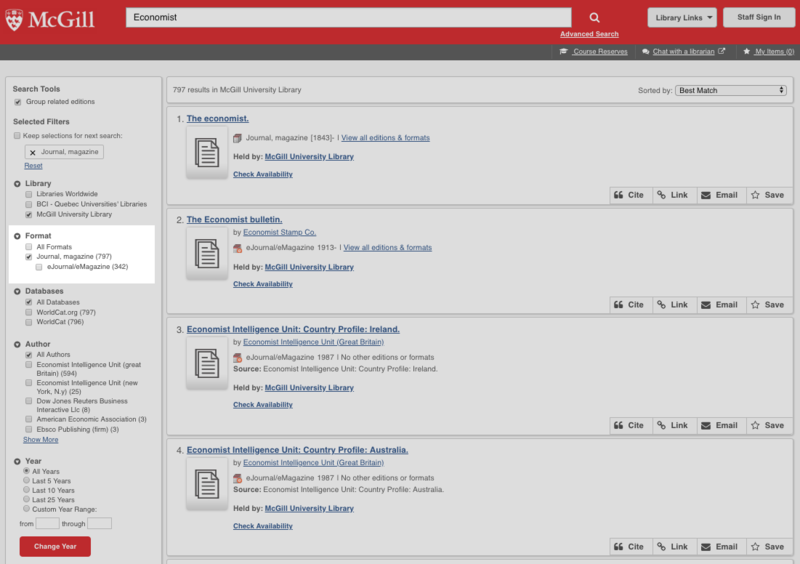 Searching for journals in WorldCat is similar to searching for books and media. You can use search using keywords, title, subjects, etc and then use the filtering features to limit your results to display journals. You can also use the eJournal/eMagazine option to only see journals where the full-text is available for you to view online.